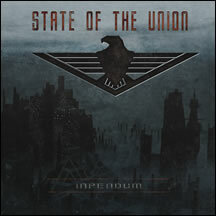 Inpendum the second full length album from State of the Union and the follow up to last years critically acclaimed Black City Lights. Picking up where its predecessor left off, Inpendum delivers 13 new tracks of hard driving synths, melodic undertones, pounding beats and ambient interludes. Tracks such as "Timerunner," "Makina Mata," "Unslave" and "Unforgiven Time" are guaranteed to pack dance floors from coast to coast while tracks like "Fall from Grace," "Lights in the Abyss" and "Trapped in Time" showcase a more mature and melodic side. Inpendum is a solid, well rounded release that will suit both the club goers and the casual listener.